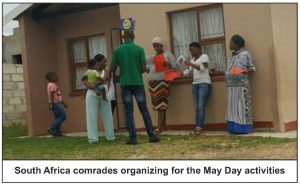 SOUTH AFRICA, May 2 – “The May Day mass meeting we organized was a great experience,” declared Lindelwa. “It inspired us as a youth collective and me personally. “I was not more part of things because I spent most of my time in the kitchen,” said Buhle. “But I listened to the comrades talk directly to the masses to explain our line and the response was really good. “We planned this May Day for about a year,” reflected Bongani. “It was a good experience. People came in numbers. Others gave us contact information. They want to learn about ICWP. So, we are going to have a communist school. 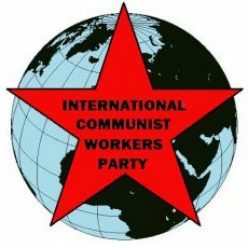 I think we should engage more and tell more people about ICWP. “An older person said that he’s really inspired by the struggle that us young people are waging,” reported Qaqamba. “It is inspiring that the work we do really inspires a lot of other people. They see that we can no longer live in such conditions, that we have to fight. It shows that when we mobilize and talk to the masses, the results will be great. “We need to go more to the masses,” Qaqamba continued. “I think we need to talk more about what a communist future will be like. “As much the intensifying fight and competition between the capitalists is showing the nature of the system and providing us with opportunities, to that extent we have to be sharp in explaining to the masses and the working class what our communist society will actually be like. How we are going to live in a collective way to eliminate all manifestations of capitalism: racism, sexism and xenophobia. To explain that we are one race, the human race, and we need to be united in fighting our enemy.